นักวิทยาศาสตร์ที่เกี่ยวข้องกับ histological sections ประกอบด้วย "histotechnicians", histology technicians (HT), histology technologists (HTL), นักวิทยาศาสตร์การแพทย์, เจ้าหน้าที่เทคนิคการแพทย์ และนักชีวเคมีทางการแพทย์ โดยวิทยาศาสตร์สาขานี้มีชื่อเรียกว่า histotechnology. เนื่อเยื่อจำเป็นต้องถูกฝังอยู่ในวัสดุที่แข็งพอเพื่อให้สามารถตัดออกมาเป็นเซคชั่นได้ โดยทั่วไป ความหนา 5 μm (ไมโครเมตร; 1000 ไม่โครเมตร = 1 มิลลิเมตร) สำหรับกล้องจุลทรรศน์แบบใช้แสง และ 80-100 nm (นาโนเมตร; 1,000,000 นาโนเมตร = 1 มิลลิเมตร) สำหรับกล้องจุลทรรศน์อิเล็กตรอน สำหรับกล้องจุลทรรศน์แบบใช้แสงจะใช้พาราฟินเป็นหลัก เนื่องจากเป็นสารที่ไม่ละลายน้ำและเนื่อเยื่อในสิ่งมีชีวิตมักประกอบด้วยน้ำ ในขั้นแรกจึงต้องมีการดึงน้ำออกจากเนื่อเยื่อ โดยการนำเนื้อเยื่อผ่านเอทานอลความเข้มข้นจากต่ำไปสูง ตามด้วยสารเคลียริ่ง โดยทั่วไปคือไซลีนเพื่อนำแอลกอฮอล์ออกจากเนื้อเยื่อ และทำให้เนื้อเยื่อใส, สุดท้ายคือพาราฟินซึ่งจะเข้าไปแทนทีไซลีนในเนื้อเยื่อและทำให้เนื้อเยื่อมีความแข็งพอ. อย่างไรก็ตาม พาราฟิน ไม่สามารถทำให้เนื้อเยื่อแข็งพอที่จะตัดเซคชั่นให้บางสำหรับกล้องจุลทรรศน์อิเล็กตรอนได้ จึงใช้วัสดุเรซินแทน. Epoxy resins are the most commonly employed embedding media, but acrylic resins are also used, particularly where immunohistochemistry is required. Thicker sections (0.35μm to 5μm) of resin-embedded tissue can also be cut for light microscopy. Again, the immiscibility of most epoxy and acrylic resins with water necessitates the use of dehydration, usually with ethanol. After the tissues have been dehydrated and infiltrated with the embedding material they are ready for embedding. During this process the tissue samples are placed into moulds along with liquid embedding material which is then hardened. This is achieved by cooling in the case of paraffin wax and heating in the case of the epoxy resins (curing). The acrylic resins are polymerised by heat, ultraviolet light or chemical catalysts. The hardened blocks containing the tissue samples are then ready to be sectioned. Formalin-fixed, paraffin-embedded (FFPE) tissues may be stored indefinitely at room temperature, and nucleic acids (both DNA and RNA) may be recovered from them decades after fixation, making FFPE tissues an important resource for historical studies in medicine. Embedding can also be accomplished using frozen, non-fixed tissue in a water-based medium. Pre-frozen tissues are placed into moulds with the liquid embedding material, usually a water-based glycol or resin, which is then frozen to form hardened blocks. For light microscopy, a glass knife mounted in a microtome is used to cut 10-micrometer-thick tissue sections which are mounted on a glass microscope slide. For transmission electron microscopy, a diamond knife mounted in an ultramicrotome is used to cut 50-nanometer-thick tissue sections which are mounted on a 3-millimeter-diameter copper grid. Then the mounted sections are treated with the appropriate stain. Biological tissue has little inherent contrast in either the light or electron microscope. Staining is employed to give both contrast to the tissue as well as highlighting particular features of interest. Where the underlying mechanistic chemistry of staining is understood, the term histochemistry is used. Hematoxylin and eosin (H&E) is the most commonly used light microscopical stain in histology and histopathology. 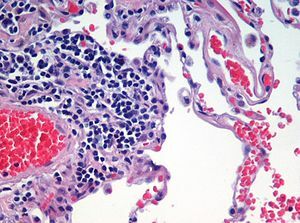 Hematoxylin stains nuclei blue; eosin stains the cytoplasm pink. Uranyl acetate and lead citrate are commonly used to impart contrast to tissue in the electron microscope. Special staining: There are hundreds of various other techniques that have been used to selectively stain cells and cellular components. Other compounds used to color tissue sections include safranin, oil red o, Congo red, fast green FCF, silver salts, and numerous natural and artificial dyes that were usually originated from the development dyes for the textile industry. Histology samples have often been examined by radioactive techniques. In historadiography a slide (sometimes stained histochemically) is X-rayed. More commonly, autoradiography is used to visualize the locations to which a radioactive substance has been transported within the body, such as cells in S phase (undergoing DNA replication) which incorporate tritiated thymidine, or sites to which radiolabeled nucleic acid probes bind in in situ hybridization. For autoradiography on a microscopic level, the slide is typically dipped into liquid nuclear tract emulsion, which dries to form the exposure film. Individual silver grains in the film are visualized with dark field microscopy. Alternative techniques include cryosection. The tissue is frozen and cut using a cryostat. Tissue staining methods are similar to those of wax sections. Plastic embedding is commonly used in the preparation of material for electron microscopy. Tissues are embedded in epoxy resin. Very thin sections (less than 0.1 micrometer) are cut using diamond or glass knives. The sections are stained with electron dense stains (uranium and lead) so that they can possibly be seen with the electron microscope. แบ่งได้เป็น 4 ประเภทคือ กล้ามเนื้อ, ประสาท, เนื้อเยื่อเกี่ยวพัน, และเยื่อบุผิว เนื่อเยื่ออื่นจะถูกจัดอยู่ในสี่ประเภทพื้นฐานเหล่านี้ (เช่น เซลล์เม็ดเลือดจะถูกจัดอยู่ในประเภท เนื้อเยื่อเกี่ยวพัน เนื่องจากถูกผลิตมาจากไขกระดูก). Artifacts can result from tissue processing. Processing commonly leads to changes like shrinkage, color changes in different tissues types and alterations of the structures in the tissue. Because these are caused in a laboratory the majority of post histology artifacts can be avoided or removed after being discovered. A common example is mercury pigment left behind after using Zenker's fixative to fix a section. ↑ 1.0 1.1 ศัพท์บัญญัติราชบัณฑิตยสถาน. เรียกข้อมูลวันที่ 19 กพ. 2552. หน้านี้แก้ไขล่าสุดเมื่อวันที่ 31 ธันวาคม 2561 เวลา 21:27 น.